At a meeting in Charles-de-Gaulle Airport this Tuesday afternoon with management and unions of Air France, French Prime Minister Manuel Valls didn’t mince his words in condemning the attack on Xavier Broseta and Pierre Plissonnier on Monday following the intrusion on a management committee meeting of disgruntled employees of the airline. “These actions are the work of hooligans” who “damage the image of France,” said Mr Valls. “The law will identify those who partook in this outrageous violence”. He added that they would be “heavily punished” for their actions. Yesterday, Xavier Broseta – the Human Resources Manager of Air France – and his colleague Pierre Plissonnier – responsible for the long-haul division – were manhandled by employees who had burst in on the central committee meeting to protest against the shedding of 2,900 jobs by the airline. They isolated Xavier Broseta in a corner of the room before chasing him outside and ripping off his clothes. The disturbances carried out on Monday resulted in seven injured (including one seriously – a security guard) according to a spokesman for Air France. 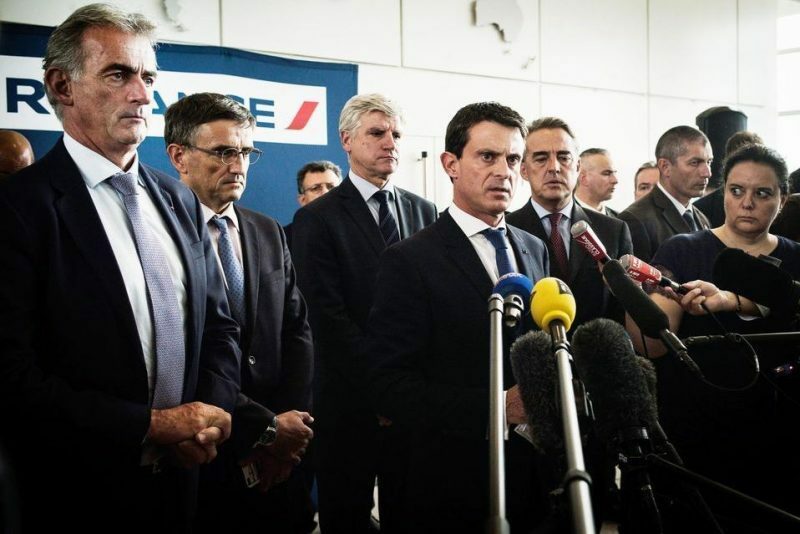 “Air France is in shock,” continued Valls at the press conference, where he was flanked by the two victims of yesterday’s violence, “and when Air France is in shock, all of France is in shock. French president François Hollande was in Le Havre for the launch of the super-sized container ship Bougainville, but added his condemnations two hours earlier.